Given the no-brainer nature of my family's morning routine (wake up, get dressed, eat breakfast, etc. ), it's heartbreaking to know that millions of kids across the U.S. are forced to go without breakfast. Especially when it's so absurdly easy to make breakfast happen. Well, actually, I should rephrase that. Share Our Strength's No Kid Hungry program does the heavy lifting by working with schools to create breakfast programs for kids in need, but for the rest of us, we can make breakfast happen with the click of a mouse. And even a donation of $1 makes a big difference in curbing hunger. I'm not kidding. A $1 donation through Share Our Strength can connect a child in need to 10 breakfasts; an $18 donation can help a child get breakfast every day of the school year (180 days). Today, the day before we're all gearing up for wonderful meals and warmth and cheer, I'm making a direct ask -- will you please join me and feed a child a breakfast (or 10? or 180?)? 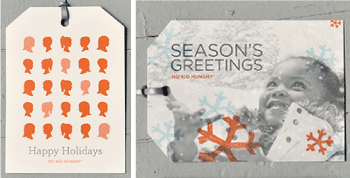 You can donate via credit card or Paypal (scroll all the way down), or by "purchasing" these pretty holiday cards (shown below). I just donated 180 breakfasts and it took about 5 seconds since I used Paypal and didn't have to hunt around for my wallet. AWESOME. And if you'd like to see living proof, take a look at this short video to learn more about how Share Our Strength improves access to school breakfast programs.